A very merry Christmas and warm holiday wishes to all of my lovely readers! 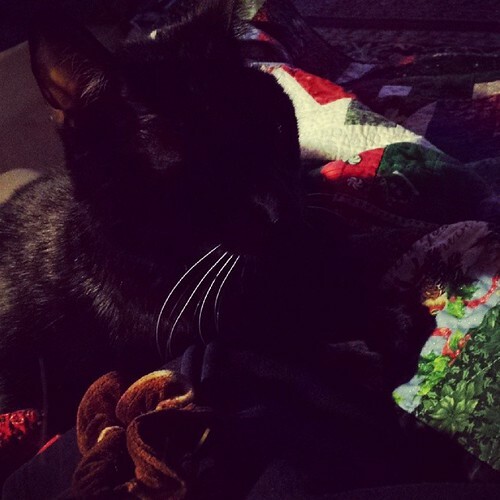 Thank you for visiting as I shared crafts and goodies from my family’s Christmas. I have just a few photos to share today and I hope they bring you a smile! 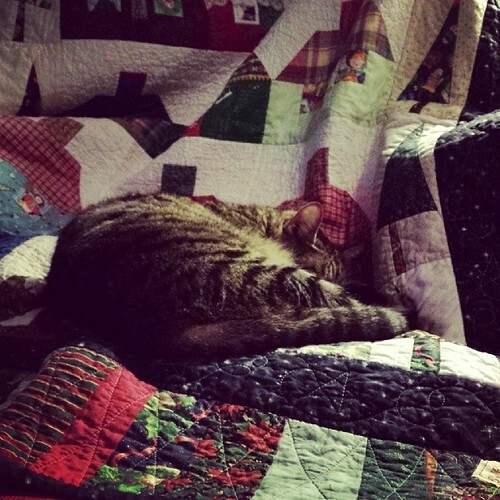 This is Marie, enjoying our Christmas quilt. 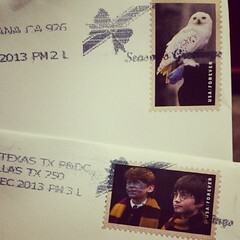 I’ve received several Christmas cards from friends and family adorned with the wonderful Harry Potter stamps offered by USPS. I ordered mine online some weeks before Christmas and put them on every single card we sent out! 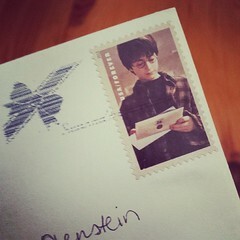 Have I squeed a little with every card received with one of these wonderful stamps? Why yes I have! Time is ticking away… Paper Piecing Vintage is just $6 through Dec. 31, 2013. You get 12 patterns in two sizes (that’s 24 patterns!) for just one payment. On Jan. 1, the price goes up to $12, so don’t miss your chance to register at half price! Still looking for the perfect gift? The Craftsy class sale has been extended one more day! Save up to 50% on classes through 12/25. Up to 50% Off Classes Today Only! There will be no Talk to Me Tuesday today and I’ll be taking a small break from online life so I can spend time enjoying my family over the holidays. I hope that you, too, will be spending quality time with people you love, whether they be family or friend, and you’re together or chatting online. 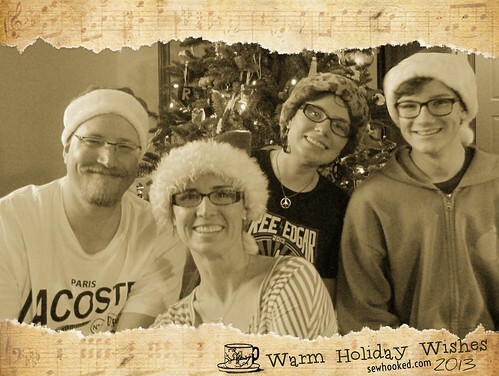 This entry was posted in Christmas, Holidays and tagged Christmas, christmas card, Family, ttmt on December 24, 2013 by Jennifer Ofenstein. Merry Christmas, Jennifer, to you and all yours. Thank you for another year of great blogs to read and patterns to make. LOL And Merry Christmas to all of you, too! You DO have the cutest family! Merry Christmas to you and your family!!! XOXO! Thanks for all the inspiration!! !